Sony Pictures/AFFIRM Films/Provident Film’s faith-based family drama WAR ROOM continues to exceed expectations, on pace to take the box office crown in its 2nd weekend. After opening as the #1 faith based movie of 2015 and the highest in the genre since HEAVEN IS FOR REAL (4/16/14), WAR ROOM had an incredible hold in its second weekend. The film is poised to take in $12.3 million from 1,526 locations for the 4-day holiday weekend, which brings the estimated total to $28.663 million. Word of mouth, media attention, grassroots marketing and social media sharing continued to propel audiences to the theater over the holiday weekend. said Tana Evans, Vice President of Marketing and Distribution for AFFIRM Films. 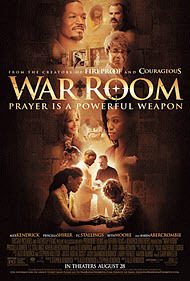 WAR ROOM is the fifth film from Alex and Stephen Kendrick (COURAGEOUS, FIREPROOF, FACING THE GIANTS, FLYWHEEL) and has enjoyed media coverage from outlets such as Associated Press, Washington Post, Entertainment Weekly, Forbes, USA Today, Entertainment Tonight, CBS, FOX News, and others. says Kris Fuhr, Senior Vice President of Working Title Agency, who co-led the film’s marketing on behalf of Provident Films with Tana Evans of AFFIRM. The budget for this PG-rated film was $3.5-million. With an A+ CinemaScore, WAR ROOM is expected to have long legs well into the fall season. A Kendrick Brothers production, WAR ROOM is distributed by Sony’s TriStar Pictures with marketing by Provident Films and AFFIRM Films. A Kendrick Brothers production, WAR ROOM is distributed by Sony’s TriStar Pictures with marketing by Provident Films and AFFIRM Films. If you have viewed “WAR ROOM,” please add your viewer comment on our Christian Spotlight REVIEW for the film.